As the Chevy Colorado enters its fifth year in its second generation, there’s some seriously stiff competition on the way from the likes of Ford and Jeep, so GMC engineers and designers realized it was time to step it up with their midsize pickup workhorse. The 2019 Chevrolet Colorado features some pretty interesting updates and improvements that are sure to keep it at the top of its game, no matter what the competition throws its way. From the outside, you’ll notice that the overall look of the 2019 Chevy Colorado remains largely unchanged. But, a few exterior colours were ditched and replaced with some new ones such as Shadow Gray Metallic and Pacific Blue Metallic. The major updates took place inside the 2019 Chevrolet Colorado where you’ll discover a new infotainment system that replaces the Chevrolet MyLink system with the new Chevrolet Infotainment System. The 2019 Colorado also comes standard with a 7” touchscreen; however, there is also an available 8” model. Oh, and since we all know how important a fully charged phone or tablet is, the 2019 Chevrolet Colorado features upgraded USB ports. There’s a standard USB hook-up along with a fast-charge plug that lets you recharge a battery more quickly. You’ll find the same engine options as the previous model year in the 2019 Chevrolet Colorado: a 2.5L inline 4-cylinder or a 3.6L V6 or a 2.8L Duramax diesel mill. 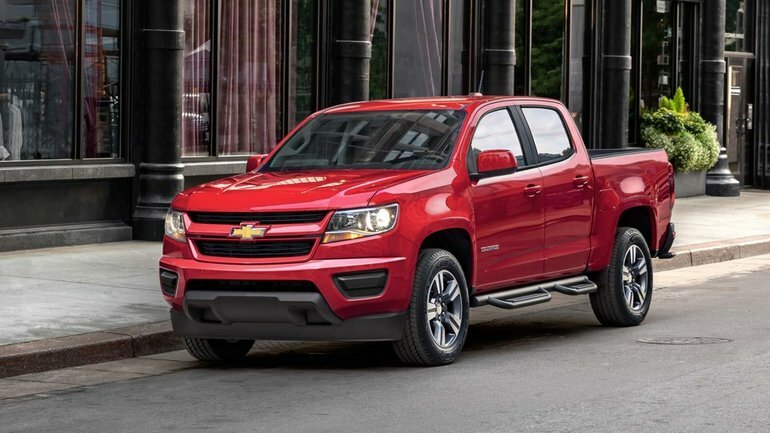 It would seem that the 2019 Chevrolet Colorado is the perfect midsize pickup built to tackle both play and work. A well-stocked model lineup offers trims and features for all needs and desires. If it’s a work truck you’re looking for or a weekend warrior for family adventures, the 2019 Chevrolet Colorado will have just what you’re after when it comes to practicality, design, drivability and capabilities. To find out more about the updated 2019 Chevrolet Colorado, head down to your local Surgenor Barrhaven Chevrolet to speak to one of our experts about everything this compact yet capable pick-up has to offer. And make sure you book a test drive, as well.